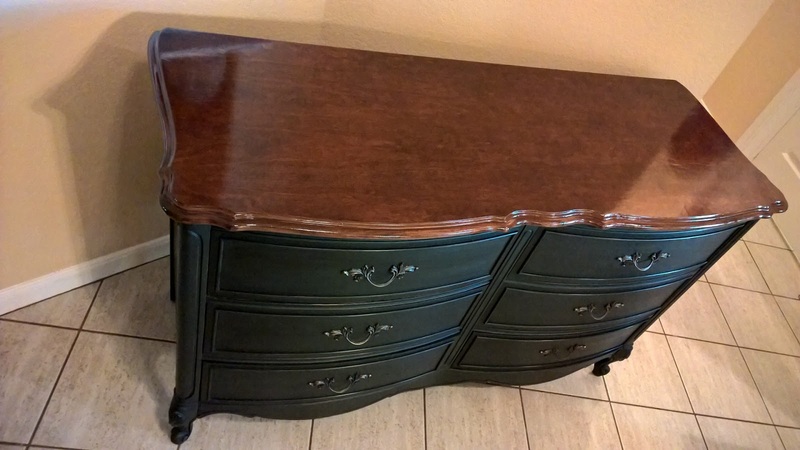 This dresser is a total showstopper! The client wanted it to go darker, so we found a beautiful inspiration piece with a stained top and painted body. For the top, I used two different shades of stain, then a stain with polyurethane, and finished with a wipe-on polyurethane. The wood grain is stunning! 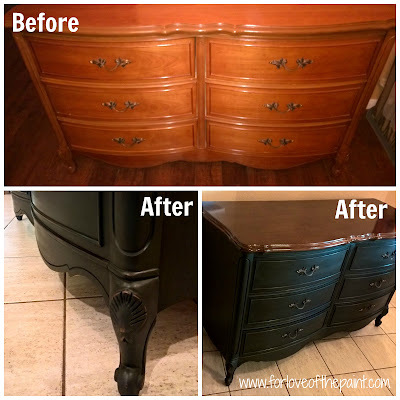 The body is painted with Annie Sloan Chalk Paint in Graphite, lightly distressed, with two coats of dark wax. Here's another angle with that rich, dimensional wood grain. I am definitely loving the finish! What a huge difference between the Before and After photos! I can't wait for the client to come see this in person, she's a real beauty! The original hardware in a vintage bronze is the perfect complement to link the brown and thunderstorm-dark gray. What a chic color selection! I have this dresser! I would love to re-stain it like this.